Did HTC plot to offer customized phone options before the Moto X? Motorola is attempting to sparks a user-first smartphone revolution with its customizable Moto X phone, but it may not have been the only one to cook up such an idea. According to a new report, HTC at one time considered getting in on the personalization act, too. 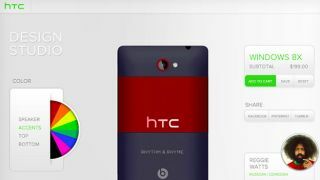 Sources familiar with HTC's plans told The Verge the company planned to launch a customization website allowing customers of U.S carrier Sprint to design their very own HTC 8XT handset. The report revealed the existence of a prototype Design Studio web app that would have allowed users colour control over the two-tone body, speaker, accents and engraving options. However, the HTC 8XT device running Windows Phone 8 was launched in July minus those options with both the manufacturer and the carrier reportedly backing out over "cost and complexity" concerns. With its new Moto X, Motorola is betting heavily on a perceived desire from smartphone users to carry a handset they can, to some degree, control the look of. The Moto X doesn't impress too much in terms of its mid-range specs, but AT&T customers in the U.S. can use the Moto Maker website to choose from two front frame colours, 18 back plate colours (new wood materials are coming soon) and seven accent colours. Buyers can also choose to have a personal message engraved on the back. Meanwhile, reports claiming that Apple will launch its rumoured iPhone 5C budget handset in a range of bright colors akin to its iPod range could also be a sign that manufacturers are conscious that buyers want more choice over their phone's aesthetics. As for HTC, it seems its design-it-yourself plans have been benched for the time being, but if Motorola does well with the Moto Maker, the Taiwanese company's phones could get a little more colorful. Wondering about the legitimacy of that iPhone 5C name? According to one source, you can take it to the bank.